Well, we warned about this Iraq Study Group. A front for the GHWB powerbase. And Here they GO with the gameplan. Split Iraq in three, eh? AN independent commission set up by Congress with the approval of President George W Bush may recommend carving up Iraq into three highly autonomous regions, according to well informed sources. The Iraq Study Group, co-chaired by James Baker, the former US secretary of state, is preparing to report after next month’s congressional elections amid signs that sectarian violence and attacks on coalition forces are spiralling out of control. The conflict is claiming the lives of 100 civilians a day and bombings have reached record levels. The Baker commission has grown increasingly interested in the idea of splitting the Shi’ite, Sunni and Kurdish regions of Iraq as the only alternative to what Baker calls “cutting and running” or “staying the course”. The commission is considered to represent a last chance for fresh thinking on Iraq, where mass kidnappings are increasing and even the police are suspected of being responsible for a growing number of atrocities. Baker, 76, an old Bush family friend who was secretary of state during the first Gulf war in 1991, said last week that he met the president frequently to discuss “policy and personnel”. His group will not advise “partition”, but is believed to favour a division of the country that will devolve power and security to the regions, leaving a skeletal national government in Baghdad in charge of foreign affairs, border protection and the distribution of oil revenue. The Iraqi government will be encouraged to hold a constitutional conference paving the way for greater devolution. Iran and Syria will be urged to back a regional settlement that could be brokered at an international conference. His group has yet to reach a final conclusion, but there is a growing consensus that America can neither pour more soldiers into Iraq nor suffer mounting casualties without any sign of progress. It is thought to support embedding more high-quality American military advisers in the Iraqi security forces rather than maintaining high troop levels in the country indefinitely. Frustrated by the failure of a recent so-called “battle of Baghdad” to stem violence in the capital, Zalmay Khalilzad, the US ambassador to Iraq, said last week that the unity government of Nouri al-Maliki, the prime minister, had only two months left to get a grip. Rumours abound that the much-admired ambassador could depart by Christmas. Khalilzad’s warning was reinforced by John Warner, Republican chairman of the Senate armed services committee, on his return from a visit to Baghdad. “In two to three months’ time, if this thing hasn’t come to fruition and this government (is not) able to function, I think it’s a responsibility of our government internally to determine: is there a change of course we should take?” Warner said. Bush and Condoleezza Rice, the secretary of state, have resisted the break-up of Iraq on the grounds that it could lead to more violence, but are thought to be reconsidering. “They have finally noticed that the country is being partitioned by civil war and ethnic cleansing is already a daily event,” said Leslie Gelb, former president of the Council on Foreign Relations. 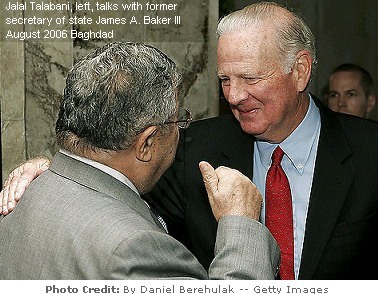 Gelb is the co-author with Senator Joseph Biden, a leading Democrat, of a plan to divide Iraq. “There was almost no support for our idea until very recently, when all the other ideas being advocated failed,” Gelb said. In Baghdad last week Rice indicated that time was running out for the Iraqi government to resolve the division of oil wealth and changes to the constitution. Many Kurds are already hoping for their own national state, while the Shi’ite Islamist leader Abdul Aziz al-Hakim is pressing for regional autonomy. The Sunnis are opposed to a carve-up of Iraq, which would further deprive them of the national power they enjoyed under Saddam Hussein and could leave them with a barren tranche of the country bereft of oil revenue. Many Middle East experts are horrified by the difficulty of dividing the nation. “Fifty-three per cent of the population of Iraq live in four cities and three of them are mixed,” said Anthony Cordesman of the Washington-based Centre for Strategic and International Studies, who fears a bloody outcome. Baghdad is a particular jumble, although ethnic cleansing is already dividing the population along the Tigris River, with Shi’ites to the east and Sunnis to the west of the city. Gelb is under no illusions about the prospects of success. “Everything is a long shot at this point,” he said. I have been reading through this forum and have to step back..., You are saying that the coup album cover was a psyop? I invite anyone who would like to share more on this topic to keep the energy going here... Hip Hop is a great alliance to all that seek truth and it has reached the peoples hearts deeply and easily. I think we are really diving into our power here and its a world filled with resources and energy, but it has been heavily exploited and has lost its respect for its collective ways in these times when maya is at its greatest strength.... The direct marketing to the "I", myspace, ipods etc etc has been chipping away at our human ability to honor and respect our tribal collective capacity and those who make those sacrifices to work alone and together. Our power is in the unity and that is what has been attacked, even you all have pointed out clearly how the same has happened to the 911 truth movement. So now we have two examples. ps. did any of you see the documentary of the coup and jeru going to africa? By Zoneil Maharaj, Pop and Politics. Posted March 22, 2006. Interview: Politically-minded emcee, Boots Riley, from the Coup talks about why he became an activist, BET today, and his new album. PandP: Why the title "Pick a Bigger Weapon"? Boots: It means "up the ante." And the reason I used "Pick a Bigger Weapon" is because I think that we're all fighting the system whether we feel like we're in the struggle or not, and that fight takes the form of struggling to pay the rent, trying to keep the lights on, things like that. Those are the struggles we all should be engaged in collectively. It's about taking our daily struggles and collectivizing them and it would be a stronger blow to the system. Also, my girlfriend and I were having dinner with poet Jessica Care Moore and my girlfriend was on her third or fourth martini and Jessica was like, "C'mon girl, pick a bigger weapon." That's symbolic of people looking for ways to make their lives better and right now we've been taught to overlook actually fighting the system together to make our life better. "Pick A Bigger Weapon" drops on April 25, 2006. Boots is also currently working on the "Instigators" album with political hip-hop group Dead Prez. Zoneil Maharaj is not as old as he looks and not as young as he acts. He is a student at San Francisco State University. HIP HOP NEED TO GET ON THE MIC AND DEFEND THE BACK PACKING BBOYS ON LOW BUDGET TOURS, WHO ALSO NEED TO GET ON THE MIC AND BACK UP THE FACT THAT WE ALL NEED TO GET INVOLVED..... THAT MEANS SHARING HOMES AND FOOD AND RESOURCES AND KNOWLEDGE. THE ENTIRE CULTURE NEEDS REORIENTED BY THE 911 TRUTH MOVEMENT. MANY ARTISTS DON'T SPEAK OUT AT FESTIVALS WHICH ARE NOT REALLY DOING ANY ACTIVISM, BECAUSE THAT THE ONE OR TWO THAT PAY THEM A YEAR TO PERFORM. SO NO REALL ACTIVISM GOIN ON AT THE FESTIVALS EITHER. Please do not get me wrong nore, misunderstand my reply. i like the points being addressed, and commentary toward hip hop as an informer on our gov corruption. Most musician's that address these issue's are anti gov in a sence, if they don't come right out and say it up front. These issue's go back into slavory. This would be a huge motivation toward anti gov from the start, if u really think about it. Amongst many issue's in our so called free country, poverty is a huge deal - which leads back to gov. if u actually sit and think about most of problems in our country, you can find a way to track it back to our gov. Although it is important to consider all possibiltiies, the Coup are artists, people of telepathy and intuition, they are awareness makers and know that everything moves in directions and could see the direction this country has been moving in enough to use an album cover like they did. But what you guys have been looking for is not the coup and cannot be found in the group called the coup. You will find that in the corporate big labels, the Ice Cubes and mainstream RAP. Much of what you are talking about and looking for is not hip hop but RAP something that is not hip hop at all. Hip hop is an alternative to RAP. Rap is of huge marketing (mind control) budgets with purposes to exploit and of materialistic goals often promoting total unawareness and drugs and the coveting of objects. I think you guys were looking for M and M and all that MTV crap. By the way, Chris over in the 911 truth forums has done a commentary on these and those issues, showing where they connect and how and why which is based on Hip Hop songs. The commentary is called Truth - Key in artistry. Notice how so many of the people that attack Chris say he is always alone in what he feels and say, yet they reject the voice of those like the Coup and Jeru and Brand Nubians and 3rd Bass and MF Doom and Creature and the visionaries. You do not find many on those org boards who are aware or recognize the voice of the youth and people of color in this country. Most of the people involved in the Key project have actually attempting to register and speak up but they are never accepted and blocked from participating. And among thousands of artists who are all clear about the fact it was not an attack but demolishions and a hiding of the concrete core - songs are being made to refllect a new generation of awareness and truth process. I don't think Fintan was stating the Coup actually had anything to do with it themselves. Perhaps we need to contact the person who actually designed that cover, whoever that may be. "I came up with the idea with the photographer. We took the pictures on May 15, and we were done with it by the beginning of June. Any similarities are totally coincidental, and it was originally supposed to be more of a metaphor for destroying capitalism — where the music is making capitalist towers blow up. The politics of the Coup have more to do with the people organizing each other." Boots seems sincere, and he is indeed an excellent M.C. Was this "photographer" perhaps sent as an agent? I want to acknowledge that I like the notion of global consciousness, and perhaps this issue needs to be looked into further as well. Joseph Palmi: "What about you people, Mr. Wilson, what do you have?" Edward Wilson: "The United States of America. The rest of you are just visiting." But what are party labels? Sincere hip hop efforts are our alternative to major record label brain wash.
Got to say that hip hop is special in so many ways that the artists, the true hip hop artists are so poetic they tend to open up their inner being to such a degree that things start to happen through them. When done as sincere truth seeking, I believe they start to tap into telepathy, and intuitions that open their minds to new levels of awareness. A documentary came out in the last few years featuring the whites who supported the black panthers, telling the story from their point of view. But when it comes to the coup, you best pick on ice cube and the 2pac fellow who was related to someone important somehow. Thats where the info you share here needs applied. 2pac, I never listened to him, he reached so many but he rolled with the gangsters rather than the coup and other conscious hip hop artists that he could have supported and work with. what i have read here relating to the coup just doesn't fit. 2pac rolled with rap stars, and thats the area of concern for the hip hop crowd. But this whole rap thing needs some healing with whole foods. As far as the coup goes, they put in their work and came up as a true indy effort! But we saw the big guy behind the coup drinking as they interviewed him.... Is that what he wants to teach? Not everything will reach everyone, and maybe he was just off duty. For the most part he is all about the positive message. Maybe his message has already reached all who needed to hear it. But we know about that Indy party crowd.... They fall short of unity, and so they fall period. But why blame the artists? Why not flip in and focus on the corporations that invaded the arts? We have been checking out the stuff posted by the hip hop heads in here, and everyone seems to be on point! Its an us plus you thing! Lets move it forward Interdependently ya'll! We are not attempting to drag traffic away from here, but rather would like you to show support for this project so we can smuggle fans across the border of apathy, and get them back here! The truth - Key In Artistry commentary was loaded in part over at the music sample hub listed above. A longer sample of the project is found at Jamwave. We are digging into every nook and every cranny setting minds free with music that gets the people back on track like a Brand Nubian stack of hits, cuz hip hop don't stop, and the truth movement won't quit! Keep on, and tell it like it is!